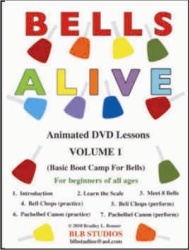 Bells Alive, by Bradley Bonner, features seven animated, interactive, 8-note bell activities for beginners of any age. The lessons are contained on a DVD which includes bells appearing in sync with the recorded accompaniments. Compatible with 8-note KidsPlay handbells, combined bells and deskbells.